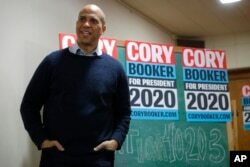 U.S. Sen. Cory Booker, D-N.J., waits as he is introduced to speak at a meet and greet with local residents at the First Congregational United Church of Christ, Feb. 8, 2019, in Mason City, Iowa. Most of the Democratic contenders hold liberal views on the economy, the environment and social issues. Many, for example, support an approach known as "Medicare for All," which would expand government health care coverage. 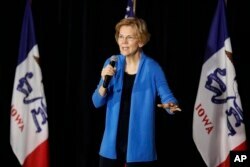 Others favor what is known as the "Green New Deal," an environmental program that would emphasize renewable energy sources and drastically move away from fossil fuels.